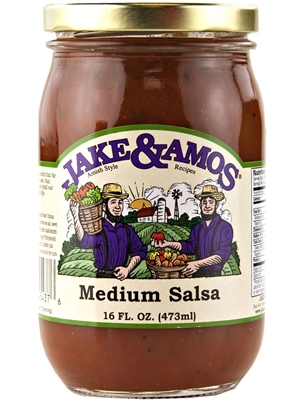 Jake and Amos Medium Salsa is filled with ripe tomatoes and perfect peppers giving this salsa a distinctively fresh taste. This salsa will be spicy enough to wake up your taste buds without setting them on fire and makes a great topping for rice or quesadillas. Ingredients: Tomatoes, Water, Tomato Paste, Onions, Green Peppers, Seasoning Blend (dextrose, sea salt, sweet red bell pepper, garlic*, modified food starch, maltodextrin, jalapeno*, spices, mustard seed), Vinegar (*dehydrated).